Every year companies are trying to keep their ever evolving workplaces up to speed with the latest trends in order to keep their employees happy and maximise output. More and more companies are saying “good bye” to rigid 9-5 working hours. With an increase in collaborative spaces, global offices and integrated technology for example, business hours are becoming 24/7hrs. In 2018 we will most likely see companies moving away from individual workspaces and moving towards unconventional dynamic spaces, home comfort spaces and dynamic workspaces. The restrictions of large technology and rigid time parameters are being left in the past. I believe to future proof modern day workspaces, companies need to get on board the globalisation trend and give their employees the means to work and any time of day. Our main areas of business in the UK are London and Manchester. Both of which can be very expensive for office rentals and rates. The efficient use of space in a workspace is therefore extremely important. The “Dynamic space” trend is not a new phenomenon. However it is becoming one of the most popular design trends in the marketplace. To explain the term dynamic we mean “something that is marked by usually continuous change”. Within a workplace context, this means a space that can transform. 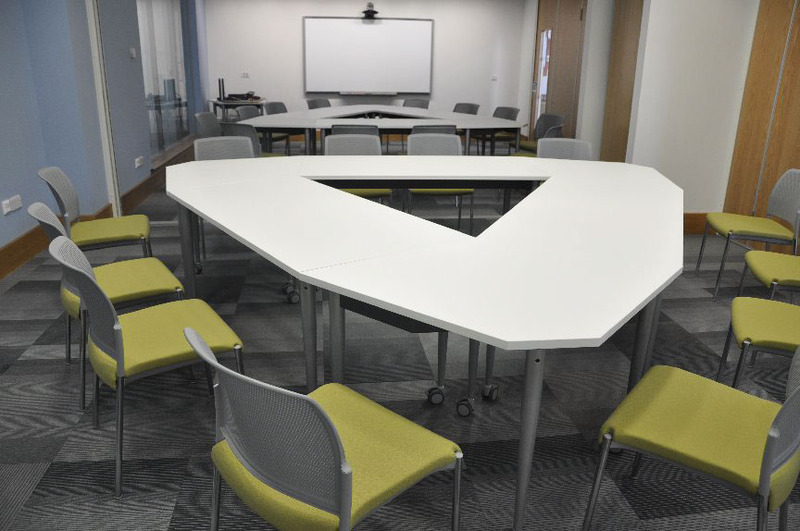 A meeting room, that can turn in multipurpose video conference room and within minutes become a training room. You will see throughout the year, more and more furniture will feature castors/ wheels for ease of movement, rooms will have curtain dividers rather than stationary patrician walls, and the use of smart boards or smart glass will increase, allowing people to literally draw on the walls. Artificial Intelligence has been a key buzzword in 2017, and it made a real impact in office design. In 2018 it will make even more strives forward in shaping how people integrate it into their workspaces. The most noticeable AI trend is the lack of human empathy that AI has. More and more tasks that would be undertaken by a human are being taken over by AI, examples such as, customer services, invoicing, and software packages etc. But what does this mean for workspaces? Rather than resist AI, workspaces in 2018 will move towards integrating AI, utilising it to the best of its abilities. Take Deloitte for example, they have “smart” lighting, “smart” parking, “smart” fitness. Analysing their workspace to make sure it works and evolves in the most efficient way possible. You will see the term “Biophillically Designed” appear on your news feed more and more throughout 2018. It simply means, using nature as a design framework within a workspace. 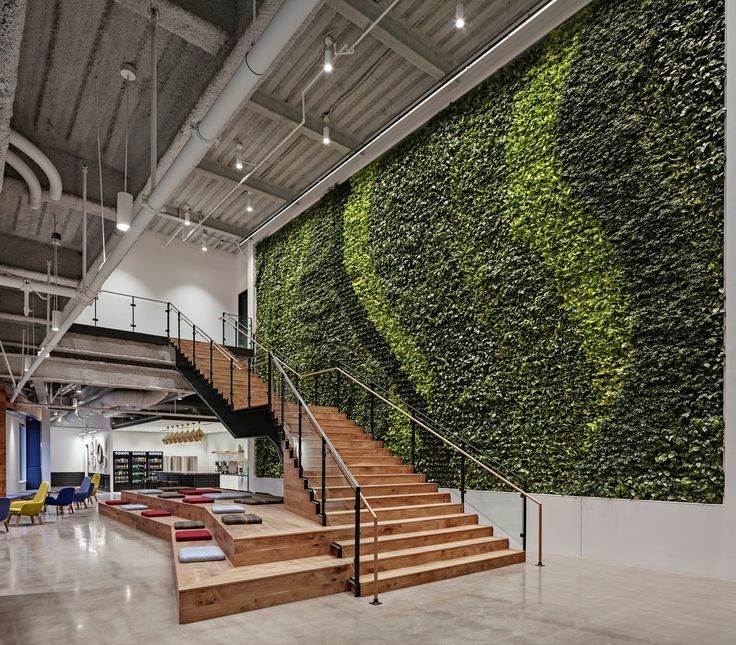 Over the past 2-3 years, more and more plants and greenery have crept into modern day workspaces. Offices have been literally tearing down walls in favour of open green spaces. In 2018 the use of plants and physical design will become more apparent, for example using plants as dividing screens. The trend has become popular as up to 90% of an employee’s day can be spent inside and the introduction of greenery in the workspace has been proven to increase motivation and efficiency. Obviously not all buildings are new or equal. There are many factors to consider when focusing on greening offices. The landlord may not let a tenant bring in a huge bush into the office for example. To get around this store wall companies have been adapting their features to include things such as office potted plants. Staying in line with the above ethos of 24/7 hours offices, there has been a rise of what we shall call “Homestyle comfort design” in workspaces. The introduction of; showers, restaurants, work bars, beer fridges, games rooms and things along this line. This is either (a) employers are listening to their employees and giving them what they want or (b) employers have realised that to keep your staff in the office longer and working better, they need to be comfortable. Home comfort design is all about making someone feel more comfortable and taking them away from the old boring single place workspaces. However there has to be a balance met, remember this it is still a workplace. I have only mentioned a few areas for ideas within this blog. If you would like to know more about how Design Office Consultancy are helping businesses create change within office design please get in contact.